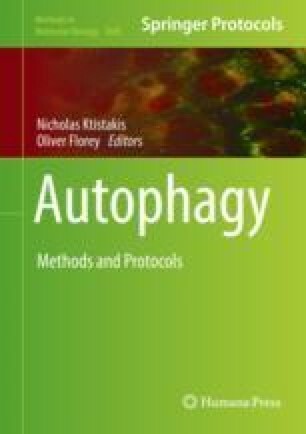 Correlative live-cell imaging and super-resolution microscopy of autophagy was developed to combine the temporal resolution of time-lapse fluorescence microscopy with the spatial resolution of super-resolution microscopy. HEK293 cells that express recombinant proteins of interest fused to fluorescent tags are imaged live to capture the formation of autophagosomes, fixed on stage to “snap-freeze” these structures, stained with appropriate antibodies, relocated, and imaged at super resolution by direct stochastic optical reconstruction microscopy. This chapter provides an easy-to-follow protocol along with practical tips and background information to help set up and perform an experiment.